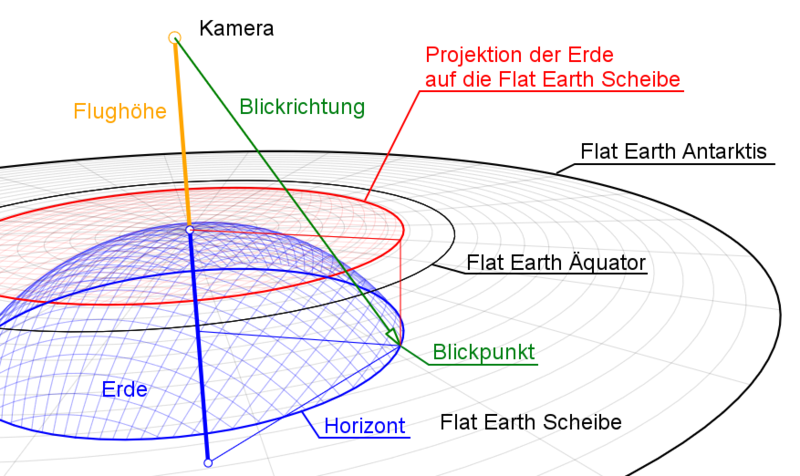 For a full Description see Finding the curvature of the Earth. Click a Button to Start a Demo. Click again to skip one step. Click the Animation to start/stop. See also Controls below. Please read the paragraph on Refraction to get familiar with this panel. Use this Formular to convert between different lengh units. You can Copy/Paste the results into input fields in the other Forms. Use this panel to save a certain App state by Get App State and use Copy/Paste to save the state in an external text file. Use Copy/Paste to copy a saved state from an external text file into this panel and click Set App State to activate this state. You can change the Parameters in this panel and apply them by pressing the RETURN button on the keyboard. Use Get App Url to get an URL containing the current App State. Click Set App State oder copy the URL into any browser address field to go to this page and display the current App State. if you have trouble understanding how perspective works on a Globe. to see a side by side comparison of the model predictions with the corresponding real images. If you activate the option Show Data then there will be 3 Lift values displayed: Absolute Lift of the nearest Object, Lift of the Horizon and Lift of the Object relative to the Horizon. The Lift values express the change in a scene due to Refraction. The values are measures as they appear at the distance of the nearest object in the scene. 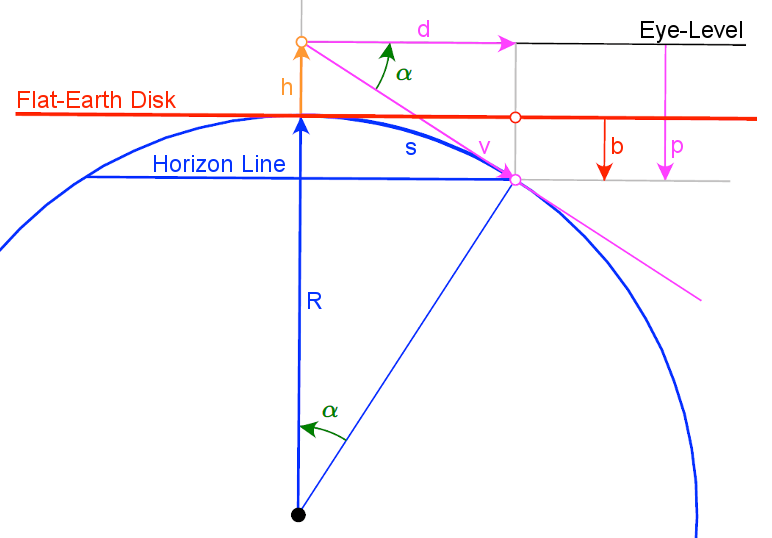 So if the Horizon Lift is 10 m, that means that the horizon appears to be lifted by 10 m as displayed on a measuring rod at the position of the nearest object. The Lift values are computed from viewing angles to the base of the nearest object and the horizon line for the cases of zero Refraction and the Refraction entered in Refraction Coeff. k. These angles are then projected onto the plane a the distance from the observer eye to the base of the object in such a way, that if the object is a measuring rod, the lift values can be read from the measuring rod. If you are looking from above onto a M-Rod object, so that it looks compressed in the vertical direction, the lift values are computed accordingly so the compressed rod can still be used to measure this values. So if a lift value is 5 m and a 10 m rod appears compressed to half its size, you can still use this compressed rod to measure the 5 m, although the lift value as it appears on a measuring rod at the position of the object on a plane perpendicular to the line of sight would only be 2.5 m.
A Lift value always corresponds to the value as read from the (compressed) scale of a M-Rod object at the position of the nearest object. You can use the Save/Restore Panel with the Button Get App URL to get an URL from the current state of the App. Copy this URL into any Web-Form (e.g. YouTube comment) and by clicking the link this page is opened with the saved state from the URL. &demo=DemoName to the page URL, where DemoName is the Name of some of the Demo Buttons above the App Dispalay. &tab=TabName, where TabNam is View, Obj1, Obj2, Refr, Unit or SaveRest. &custon=CustomDemo, where CustomDemo is the name, the user gave to one of his Demos. Click Set App State oder press Enter. The image will be overlayed to the graph and automatically resized to fit without distortion with a transparency of 0.5. You can change the transparancy by clicking on the image. The more left you click, the more transparent the image gets. Earth curve simulation with texture and atmosphere from Movie Vertigo.